Mizuki has been in this world for two months now so I think it's finally time I write down the details of her birth before I forget too much. Colin took such amazing photos too, I'm so grateful for these moments he captured. Having passed Birdie's due date, we had begun to talk about what the plans were if she went too far overdue. My main goal was to not have a c-section, so we wanted to do whatever we could to forego induction. I had a midwife appointment on a Wednesday, and was offered a membrane sweep to encourage things to start up but I felt like I could wait a little longer for things to start up naturally, so we made a plan to meet on Saturday. A couple times that week I had nights of false labor which really got my hopes up, but they didn't turn into anything. On Friday I started having little inklings that maybe my body could be preparing to begin, but I really didn't want to get my hopes up again so I didn't talk too much about it. I went for a walk in the morning, had a nice nap in the afternoon, and decided to go for acupuncture as another method to encourage my body along. I was starting to feel surges in my body at slightly more regular intervals so I texted my mom before bed letting her know I might be calling her in the morning. At 1:30 am I woke with contractions I couldn't ignore so I went to the bathroom to try and deal with them solo for a bit. Not long after I woke Colin up to help me out, and a couple hours later he called my parents to join us. I had started puking, which sounds gross, but I never puked with Sloane and that made me feel like things were moving along better so I was actually pretty encouraged by that. At some point after my mom joined us, I lay down for a bit because I was so tired, and the contractions slowed down a bit. This scared me because when I was in labor with Sloane my contractions would get super irregular anytime I laid down, which kind of indicated how things weren't progressing properly. But this time around as soon as I got back up, the contractions continued at their regular pace. We gave my midwives a call and decided to head into the hospital. The midwives met us at 7:30 in triage, and I finally was going to be checked for how far I had dilated to see if I could get admitted to a room. This was another fearful moment, since when I was labouring with Sloane it seemed I was forever stuck at 6cm, and was discouraged anytime I was checked. When they finally checked me we discovered I was between 7-8cm dilated, and I was so happy I might have laughed, or cried...but I definitely puked. Because I was entering transition. Thus began the craziness! I mean, all totally normal, but holy crap, childbirth is crazy. At this point, every part of this experience was new to me. I laboured for a while in the shower and was able to try out nitrous oxide gas as a means of taking the edge off the pain. All I remember is it wasn't helping as much as I would have liked it to, so I decided to just give'r and take in as much as I could to see if it would help. Colin was holding me up in the shower and it suddenly felt like he was very far away, and I got so scared, so I decided to chill out on the gas. I also remember asking a few times if an epidural was possible but the midwifes said at this point I was so close and it would be too late. I guess that was a good indication that things were moving along and I finally moved to the bed to start pushing. So about the pushing stage. I feel like I had heard from several people things like they were "relieved" to finally be able to push and "liked playing an active part" in the process. So I had these expectations that pushing would actually maybe be slightly more enjoyable than what I had just spend the last few hours doing. NO. NO IT WAS NOT. Man, it wasn't fun. I was like, dear God, get a vacuum or something and just get this kid out of me! The pushing stage lasted 1.5 hours for me, but the slightly interesting thing about that was my contractions slowed down to sometimes 5 minutes apart, where I was able to fully fall asleep between each one. It was like my body knew I needed the rest and recovery to have energy enough for each push, so it let me have it. For that I am thankful. Also, these photos that Colin took of my mom beside me are so precious to me. They must have been in moments when I was sleeping because I don't remember her putting her hand on me, but they show how wonderfully supportive and amazing my mom has been through both my births. She truly was a rock for both Colin and I. I love her. And then at noon, wondrously, she came. My baby girl, Mizuki Bird, long and lean, so healthy and pink. She cried once when she came out and then not at all. She kicked up on my stomach like a little frog, looking for food, and she knew how to nurse immediately. Even when she was taken to be weighed and measured, she didn't cry. She just cozied up on the warm table. I feel this sense of pride when I look at her and see how pink and full she looks, is that weird? Parents are proud of weird things. I think the photo of her looking at her weight is my favourite because it pretty much sums up how we all reacted. She was much bigger than we even guessed! And finally, Colin got to hold his baby girl. While she looked small compared to what we remembered Sloane to be, she was actually 1.5lbs bigger, all her weight was in her length. She may look more and more like her dad as time goes on. After about three hours after having Birdie, we were allowed to go home. I can't say enough about how wonderful the experience of having midwives in the hospital was. Coming from someone who always dreamed of home birth as the ideal, this experience was truly the best of both worlds. The only people I saw outside of my birth team were the admitting nurse and the nurse who quickly put in my saline lock. My surroundings were calm and quiet, and I had a huge window that looked out on the crazy snowstorm that was happening outside. And, being able to head so soon was a great gift. I was only at the hospital for about 8 hours! 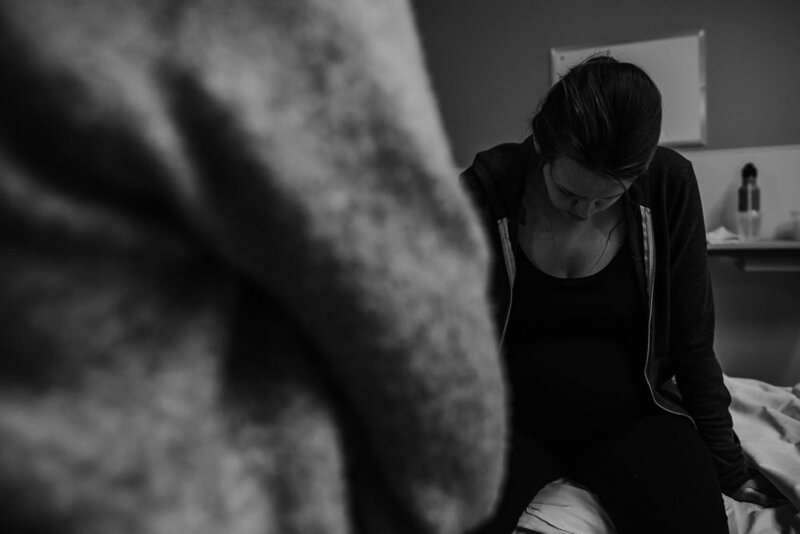 I was able to experience how crazy hard the full nine yards of childbirth is (though lets be honest, ending up with a c-section last time was incredibly hard, just in different ways). Some women speak about feeling so empowered or at peace through childbirth. I wanted to feel this, but the overwhelming feeling was: wow this is so hard I want it to be over haha. I'm not sure what I want to do next time (the fact that I'm already talking about a 'next time' is worlds of difference from my mindset after Sloane) as the experience at the hospital was quite nice and I can definitely see the appeal of a potential epidural. 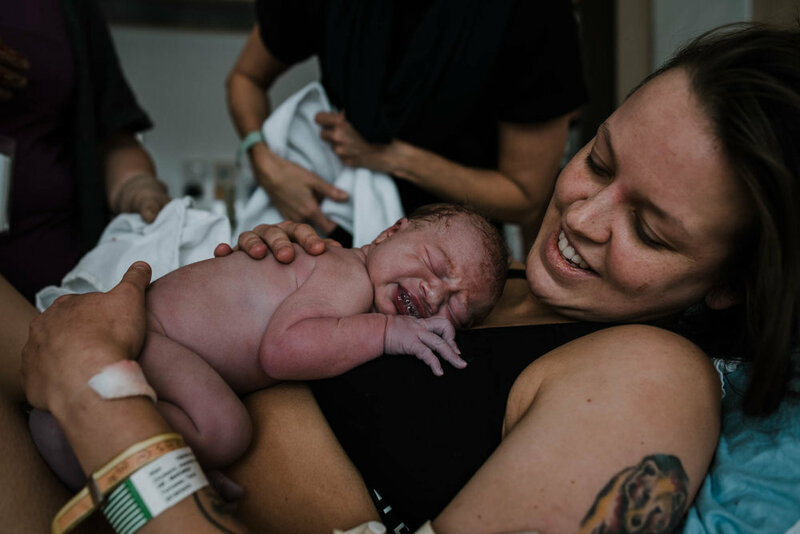 Overall I was able to regain so much trust in my body through this childbirth experience: the knowledge that my body knows what to do, and is capable of doing it. Another major feeling I am left with is extreme thankfulness for the people around me: the skilled and lovely midwives, my doula/hero/mom who was there to look me in the eye every time I needed and tell me I could do it, and Colin, who stood by me ready to help with anything and captured amazing photos. And my dad who came over in those wee hours of the night and hung out with Sloane for the day, AND captured that first amazing video of Sloane meeting Birdie. So, so thankful. And my Birdie girl, you are a sweet gift to my soul.